« What do tonight’s developments add to the story? PB regulars used to the hurly-burly of many of the site’s threads might have been shocked to read what happened overnight. After a heated and fractious discussion following the latest hacking story the former Labour MP and contributor here since 2004, Nick Palmer, suggested that we all look at our political opponents and try to write something positive. Extraordinarily people followed the suggestion and peace broke out. It was as though it was Christmas. So to mark the occasion we have a Marf cartoon which sort of gets the flavour. 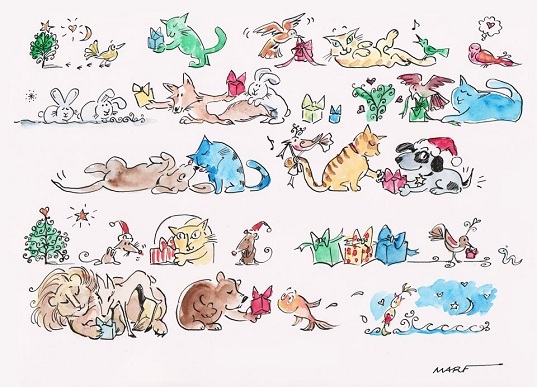 She’s providing a print of the drawing to Nick who is a keen cat lover. If anybody else would like a copy I’m sure that Marf will produce one – though you’ll have to pay!